My musical taste is wide and varied (if you hadn’t figured that out by now), but one of my favorite styles is folk, which then connects to bluegrass, some elements of country, and celtic. My Uncle Tom had similar tastes, and many years ago he introduced me to a favorite musical of his, The Robber Bridegroom (book and lyrics by Alfred Uhry, music by Robert Waldman, adapted from the novella by Eudora Welty, based on an even older folktale). Especially for when it was first produced in 1975, it was a rarity among Broadway musicals, for it had a country and bluegrass score, with the musicians on the stage. I can count the musicals that have done this on one or two hands, the latest being last season’s Bright Star with a score by bluegrass artist and comedian Steve Martin. [The Robber Bridegroom] tells the fable of the Robber Bridegroom in 1795 in Rodney’s Landing, Mississippi. It is a fable about, as the song says, “A gent and a robber all in one, A girl who made the moon burn like the sun. A greedy witch, A man that rich. A brain that big, A filthy pig. A talkin’ head. … Once upon a Natchez Trace!” So let’s meet the characters. The “gent and robber all in one” is Jamie Lockhart, a gentleman robber who is also the Bandit of the Woods. He charms to get in, and takes what he wants. The girl who made the moon burn like the sun is Rosamond, the beautiful daughter of the “man that rich”, Clemment Musgrove, a wealthy planter, and the step-daughter of the “greedy witch”, Salome, current wife of the planter. Rosamond wants love, and finds it with the Bandit of the Woods, but doesn’t want to get married to the gentleman her father prefers, Jamie Lockhart, who wants to marry Rosamond not for love, but for the plantation. The “brain that big” refers to the brain the size of a pea belonging to “Goat” the simpleton hired by Salome to kill Rosamond to gain the reward of a suckling pig. The “filthy pig” refers to Little Harp, a thief and robber who travels the country with the talkin’ head of his brother, Big Harp, and who plans to steal both the gold and the girl of the planter. “Once upon a Natchez Trace”, of course, refers to the historic forest trail that connects landings like Rodney MS with the mouth of the Mississippi in New Orleans LA. As you can imagine from this cast of characters, we have a backwoods story of greed, love, lust, and desire. Quite a fun tale. This production, as I noted earlier, was a student production under the direction of Cathy Susan Pyles (FB), with musical direction by Evan J. Marshall (FB). The fact that this was a student production means the range of talent and experience is wide and varied. We had some performers for whom this was their first time on stage … ever. We had some who had been in a fair to large number of amateur and other unspecified shows. In other words, this was a cast with a range of raw talent in both performing and singing. The latter is significant, for LAVC does not have a formal musical theatre program, and so there was not a formal effort to improve and strengthen vocal quality with this show (at least noted in the program, as there was no credit for vocal coaching, and no vocal coaches on the LAVC faculty). Again, raw talent up and coming, gems that required various levels of polishing. One doesn’t go into a show like this expecting virtuoso Broadway-caliber performance; one expects to be able to note strengths and weaknesses. Hopefully, the performers expect this as well, taking any weaknesses as areas to work on for the future. And thus, the caveat is ended. In the lead positions were Jacob Reynolds/FB as Jamie Lockhart and Tiffany Fuller/FB as Rosamund. Both were good (at least to my untrained eye) on the performance side — believable as their characters, having fun with their roles. I was particularly smitten by Fuller’s performance (and not just due to her smile and other charms) — writing this up I discovered she was from Kentucky, and that clearly showed in the accent and country mannerisms she brought to the role. Both had good singing voices that were pleasant to listen to, but that could use a tad more strength and volume. Rosamund’s family was portrayed by Nicholas Goodreau/FB as Clemment Musgrove (Rosamund’s father) and Victoria Pizarro/FB as Salome (Rosamund’s stepmother). I quite enjoyed Goodreau’s performance — he had the right bearing and style for the role. For the most part his singing was good, especially in some harmonies, although there were just a few time he was a little off. This was Pizarro’s first time on stage, according to her credits. Especially in consideration of that, her acting performance was strong and it was clear she was having fun. Where the inexperience showed was vocally, although it was unclear the extent to which that was part of her character. Her voice was a bit weaker and all over the map at times. An area to work on. The other major characters were R. J. Godinez/FB (Little Harp), Robert Butler/FB (Big Harp), Tristan Samson/FB (Goat), and Cameron Caddell (FB) (The Raven). As his character, Butler’s performance was more limited (he was a talking head in a box, after all); but the others were all strong as their characters. I was particularly taking with Godinez and Samson’s performances and characterizations; both also had good singing voices was reasonable strength. I did really like Caddell’s voice as the Raven — it was quite lovely — and her peformance was remarkably athletic in all the climbing and jumping and movement she had to do. Most of the cast also played members of the ensemble. Other ensemble members and minor characters were: Serena El-Farra (FB) (Ensemble, Goat’s Mother); Carlos A. Gomez Jr./FB (Ensemble, The Caller); Ann Kriss/FB (Ensemble); Chase Mac Leay/FB (Ensemble, Landlord); Mariam Petrosyan/FB (Ensemble, Goat’s Sister); Zihan (Layla) Zhao/FB (Ensemble). There was quite a skill mix here, but all were clearly having fun and doing their best to be characters at the given place and time. Singing-wise, there was a wide range of performances, from strong singers to weak. There was also a good variety of shapes and looks. A few specific notes: Although she didn’t have a large singing role, the few times I could single out El-Farra’s voice, I was quite impressed with it. On the other end of the spectrum, Zhao needs to work a bit on her voice. Not singing (as I don’t recall being able to single out her singing voice), but more moving past her native accent to get the words out a little bit clearer and stronger. I also recall that I enjoyed Petrosyan’s voice the one or two times I could pick it out, and thinking Kriss could have made an interesting Salome. On-stage music was provided by a four-piece bluegrass group led by Evan J. Marshall (FB) on Mandolin. Rounding out the group were Mike Ley (FB) on Bass Fiddle, Alex Finazzo (FB) on Guitar, and Hiro Goto (FB) on Fiddle. Jean Sudbury (FB) does the fiddle on March 25 (tonight). I was very impressed by the music during the show, and will actually look for albums from the Mandolin and Guitar artists. There was no specific choreography credit. Turning to the production and creative side: The scenic and lighting design by Jennifer L. Read (FB) was quite strong. I still recall the scenic design of the ICT production, with a large metal scaffoding in a U-shape with a large center portion. Read’s design was very different: very wooden and muscular, with a wood floor, sawhorses and planks, and a wooden structure along the back of the stage with ladders and ropes and such. She much of had fun shopping at Home Depot or Lowes :-). It worked quite well and was used in many creative ways by the cast to create all sorts of objects. The lighting design was equally strong, combining use of Lekos and what appeared to be some LED lights and spots to establish mood and focus attention. Mary Reilly‘s costume design seemed appropriately rural and rustic, as befits Rodney MS at the end of the 18th century. The costumes also served to distinguish the characters well and were quite fun to watch. To the right is a picture of the cast and musicians, which also shows the wonderful set and costumes (picture snarfed from the director’s FB page — and shows L-R, (back row) A. Kriss, C. Caddell, C. Mac Ley; (back +1) T. Fuller, J. Reynolds; (back + 2) M. Ley, H. Goto, R. Butler, Z. Zhao, V. Pizarro, N. Goodreau, M. Petrosyan, S. El-Farra, E. Marshall, A. Finazzo; (front -1) C. Gomez, R. J. Godinez; (front) T. Samson). Rounding out the production credits were: Victor Gonzalez/FB – Production Stage Manager; Mark Svastics (FB) – Technical Director; Jade Hill/FB and Ryan Schmitt/FB – Assistant Stage Managers. 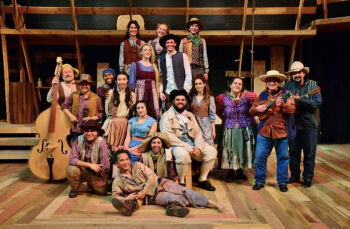 The Robber Bridegroom (FB) continues at LA Valley College (FB) throughout this weekend, with matinees today and Sunday, and an evening performance tonight and Sunday night. Tickets are available at the door or via BrownPaperTickets. Upcoming Shows: This evening our gears shift to Gershwin, with the touring company of An American in Paris at the Hollywood Pantages (FB) on Saturday. April starts with Cats Paw at Actors Co-op (FB) and a concert with Tom Paxton and the DonJuans at McCabes Guitar Shop (FB). The next day brings the Colburn Orchestra at the Valley Performing Arts Center (VPAC) (FB). The weekend of April 8 brings Kurt Vonnegut’s The Sirens of Titan at Sacred Fools Theatre (FB). Mid-April brings Doc Severinsen and his Big Band at Valley Performing Arts Center (VPAC) (FB) on April 13, followed by Animaniacs Live at the La Mirada Performing Arts Center (FB) over the weekend. That will be followed on the penultimate weekend of April with Sister Act at Cabrillo Music Theatre (FB). The last weekend of April has two holds: one for the Renaissance Pleasure Faire, and one for Uncanny Valley at ICT Long Beach (FB) [we’re just waiting on Goldstar]. Lastly, looking to May, the schedule shows that it starts with My Bodyguard at the Hollywood Pantages (FB) the first weekend. It continues with Martha Graham Dance and American Music at the Valley Performing Arts Center (VPAC) (FB). The third weekend brings the last show of the Actors Co-op (FB) season, Lucky Stiff, at Actors Co-op (FB). May concludes with Hello Again at the Chromolume Theatre (FB). As for June? Three words: Hollywood Fringe Festival (FB). That, barring something spectacular cropping up, should be the first half of 2017. Last night, we went out to Los Angeles Valley College to see their production of “The 25th Annual Putnam County Spelling Bee. This was the second LAVC production we’ve seen (the first was Alicen), and yet again I was impressed by the quality of the production. This little community college is doing great stuff, and is a wonderful value for the production one receives. I’ll also note this was our second time seeing Putnam County: we saw it previously in 2007 in the Broadway/LA production at the Wadsworth Theatre with the original cast. This little production, I feel, equalled (if not bettered) the quality of the touring cast. That’s saying quite a bit. For those not familiar with the show (music and lyrics by William Finn, book by Rachel Sheinkin, conceived by Rebecca Feldman), it tells the story of six mitsfits at a local Spelling Bee, and their quest to win the Bee. However, these six aren’t the only participants in the Bee: there are also four audience members drawn at random, who sink or swim on their own. In the first half of the Bee, you clearly know who will win (the cast members) and who will lose — the fun part is learning the back-stories for the competitors, and seeing the crazy introductions the writers have — both for the cast members and the audience participants. Evidently, there are different words given to audience participants each show, with extremely funny definitions (words in this show included “Bottle”, “Hybrid” (which was misspelled! ), and a word so long I can’t remember it). The definitions (and the use of the words in a sentence) is hilarious (although many of last night’s guests forgot to ask for both). The second half of the show is the serious competition, with the final five contestants being winnowed down. During this part you learn more about the kids and see how they grow — and what is really inside of them. I should also note that the writers tailor the background schools of the characters to local schools, and have topical and local jokes. Translation: they do their homework. Marcy Park (Julia May Wong), an Asian overachiever, who knows five six languages, excells in sports (and everything else), and who is driven to win the bee. Leaf Coneybear (Wes Schilling), a second-runner up who got to the competition because the kids in front of him had to attend a Bat Mitzvah. Comes from a hippie family, in this show, from Topanga Canyon (hmmm, he was from Topanga Canyon in the 2007 production as well). William Barfée (Paul Dietz), an eccentric character who spells words before saying them with his “magic foot”, who is allergic to peanuts and everything else, and who is probably like someone you knew in your high school. Olive Ostrovsky (Alyssa Carter (FB)), an isolated newcomer to the Bee, whose parents seem to be taking out their agressions through her, and so she finds the dictionary a safe place to hide. Logainne Schwartzandgrubenierre (Melanie Wahla), the product of two dads who are pushing her to succeed… however she can. Chip Tolentino (Iain Gray), last year’s winner, a fearce competitor… until other problems rise up to distract him. Rounding this out are Rona Lisa Peretti (Cornelia Rinderknecht Eller), the mistress of ceremonies and the #1 realtor in Putnam County; Douglas Panch (Lorin Henner (FB)), the vice-principle serving as judge, and Mitch Mahoney (Antonio “Mookie” Johnson), who is doing his community service by comforting kids when they lose. Also onstage was the conductor/pianist, Patricia Hannifan. As I said before, I think the LAVC cast was a very strong cast. I have nary a complaint about their performances, even when I compare them in my memory to the Broadway cast. In terms of strong performances, I was particularly taken with Melanie Wahla’s Logainne — she nailed the lisp as well as the character, the energy of Wes Schilling’s Leaf, and the innocence of Allyssa Carter’s Olive. I also really liked Cornelia Eller’s Rona (hell, I still have her business card), and how much she became the character. Perfect, perfect performances. Some performances surprised me. I initially didn’t like Paul Dietz’s Barfée — it is hard to copy Dan Fogler, and Dietz did not have Fogler’s look. I also initially didn’t like how Dietz did the magic foot and facial expression. However, as the story went on, I became more impressed with him, and grew to like his spin on the role. Similarly, Julia May Wong’s Marcy initially struck me as looking a little old for the character (a complaint I also had with the Broadway cast), but she did a wonderful job on her number (“I speak six languages”) and won me over. Putnam County is a really fun show, and one I’m surprised doesn’t get done more at the High School level (c’mon, do you think a little song about an erection would raise such a, oh, right). The LAVC production is great fun, and quite affordable ($15 general admission, $10 students and seniors) — and even more so considering the quality that you get). Turning to the technical side: The production was directed by Cathy Susan Pyles, with musical direction by Patricia Hannifan. Marjorie Vander Hoff served as choreographer, and made effective use of the thrust stage that LAVC utilizes. The scenic design was by the director, Cathy Pyles, and was simple and effective — the scenic design is one of the strengths of this show in that it doesn’t require a lot. Costumes were by Judy Ashton, who captured the original look well. The lighting design was by Pettifogger and used the conventionals and scrollers much better than in their previous production, although one lighting cue was a bit fast. The lighting design assistant was Cullen Pinney. Sound design was by Matthew Strunim. Danielle DeMasters served as stage manager, assisted by Timothy Miller and Nicole Ruiz. The house manager was Janette Jara. “The 25th Annual Putnam County Spelling Bee” continues at LAVC until October 24, with performance October 15-17 and 22-24 at 8 p.m. (plus a 2 p.m. matinee on October 17) in the Horseshoe Theater. Tickets are $15 for general admission, and $10 for students and seniors. For more information, contact (818) 947-2790 or cathysp@sbcglobal.net. The Horseshoe Theatre is at 5800 Fulton Ave, Valley Glen, CA 91401. Upcoming Theatre: Our next scheduled theatre is Sunday October 18, when we’re seeing the Donmar workshop version of “Parade” at the Mark Taper Forum. The next weekend will see two productions: “Guys and Dolls” at Cabrillo Music Theatre on Saturday October 24 @ 8pm, and “Meeting of Minds” Episode #9 (Martin Luther, Plato, Voltaire, Florence Nightingale) at the Steve Allen Theatre on Sunday October 25 @ 8pm. Halloween weekend is currently open, as is the first weekend of November. November 11th (Veterans Day) we’re at a Day Out With Thomas at Orange Empire Railway Museum. The following weekend Erin is going to the TMBG concert at UCLA, while we will attending Havdalah with Peter Yarrow at the American Jewish University. On November 22 at 2pm we return to REP East Playhouse for “M*A*S*H”, followed by the next installment of Meeting of Minds (pending ticketing). Thanksgiving weekend is currently open; however, it might be taken by a shift of our production for the following weekend (“Baby Its You” at the Pasadena Playhouse, December 5 at 8pm… which, by the way, features the actress who played Marie Antoinette), due to the fact I head out the morning after we see it for ACSAC in Hawaii. That same weekend (December 3, 4, 5) also brings “The Taming of the Shrew” at Van Nuys HS — we’ll likely be going to the Friday, December 4 performance. I fly out to Hawaii for ACSAC on 12/5 (hint: registration is now open and we have a great technical program — so come to the conference). While there, I hope to get together one night with shutterbug93 and see some local theatre. I return 12/12 (and, alas, this is why we can’t see Equus at LA Valley College the weekends of 12/3-5 and 10-12). The rest of December is currently open, but I know that sometime in December I’ll be attempting to ticket “Mary Poppins” at the Ahmanson (HotTix were supposed to go on sale 10/23, but may not as per the postscript below). As always, I’m looking for suggestions for good shows to see, especially if they are on Goldstar or LA Stage Tix. An interesting postscript to the above: There may not be HotTix to “Mary Poppins”. According to my contact in Audience Services at CTG, Disney and Center Theatre Group are in the midst of negotiations for HotTix. Disney is not in favor of having discount tickets and CTG would like to continue the HotTix program for this show. I’m waiting for the final answer on this, but we might be up in the balcony for that one. Last night (sort of a the last minute), we went over the the Horseshoe Theatre at LA Valley College to see the Theatre Arts Department’s production of Alicen. We had been alerted to the production through divasteph on Facebook (production page), and had been debating going, but it wasn’t until yesterday that we knew for sure nsshere’s schedule. Alicen is a new play based off of the two main Alice stories (Alice’s Adventures in Wonderland and Through the Looking Glass, as well as other Alice-related writings of Charles Dodgson). The new adaptation was developed by Christopher Coddington (who also directed the production), and is relatively faithful to the books (the first act being “Wonderland”, the second act being “Looking Glass”). As this was a reasonably faithful adaptation, I won’t retell the stories, other than to note that most of the well-known incidents are included, but contrariwise, some of them have been left out. This faithfullness led to an extremely long play (clocking in at 3 hours, with each act approximately 90 minutes). I’ll note that this is one of the first productions of this adaptation, and thus is in some sense a workshop: thus I’ll suggest that the play could use with some trimming and tightening for the audience does feel the length of the production. Although I refer to Alicen as a play, it is in reality a musical, with music by Matt Sheridan and Eric Killian (perhaps better known as “The Modlins”), with additional music and arrangements by Shane Richardson, Stephanie Pressman, Richard Rossi, and Crystal Castillo. The songs are mostly adaptations of the poems in the stories, and run the range from folk to rap (the rap version of “The Walrus and the Carpenter” is particularly amusing). I also enjoyed the musicalization of “Jabberwocky”. Within the show, the “band” consists primarily of Stephanie Pressman and Shane Richardson (both of whom sing and play guitar), as well as some other cast members who also play guitar and sing. I found the music very entertaining, especially some of the duets where the voices blended quite beautifully. I’ve heard rumors of a recording of the score — if that pans out, it would be a wonderful preservation of the delightful tunes. The acting ensemble was quite talented, and speaks well of the theatre arts program at LAVC. In the lead, playing the Wonderland Alice (there was also a young-Alice and an adult-Alice) was Crystal Castillo. Ms. Castillo was remarkable in the role, showing strong singing and dancing abilities as well as good acting abilities. Another remarkable cast member was Richard Rossi [ ] as Charles Dodgson/White Knight. I found him enjoyable as Dodgson, but even more enjoyable as the White Knight, where he was having fun with the role and seemingly ad-libbing (which I later learned was scripted, making him even stronger in my book). Also enjoyable were Timothy Miller [ ] (Lewis Carroll; Dormouse; Red King) and Marina Gywnn [ ] (Alice Liddell). Others in the large ensemble (more) — which was quite talented — were: Norma Arroyo [ ] (Edith Liddell), Simon Benjamin (Baby/Pig; Gardener 5; Ensemble), Bethany Bodin [ ] (Tiger Lily; Ensemble)), Adam Cloud [ ] (Fish Footman; Red Knight; Ensemble), Shawn Conklin (Caryl Hargreaves; Knave of Hearts), Nick DeNicola [ ] (Robinson Duckworth; King of Hearts), Courtnie Di Piazza [ ] (Red Queen; Miss Prickett), Julio Dominguez (Tweedledum; Ensemble), Nina Donato (Duchess), Cloey Eo (Frog Footman; Gardener 7; Ensemble), Leslie Holland (Ensemble), Azmyth Kaminski (Caterpiller), Katherine Ko [ ] (Lorina Liddell), Sherrie Lewandowski [ ] (Queen of Hearts), Alvyn Lopez (Gardener 2; Ensemble), Carlo Maghirang [ ] (Mad Hatter), Angela Manetti (Fawn; Ensemble), Lyle Middleton (Executioner; White King), Addison Randall [ ] (Humpty Dumpty), Shandar Robinson (Cook; Rose; Ensemble), Colleen Shelley (White Queen), Johnathan Solarte (Cheshire Cat), Theresa Strand [ ] (March Hare), and Andrew Wolf [ ] (White Rabbit). Turning to the technical side: The Horseshoe Theatre at LAVC is a small facility, sitting the audience in a few rows around 3 sides of the stage. No amplification is necessary. Lighting, however, is. The lighting design was by P. T. Fogger, and had both strong and weak points. The strong point was the use of four spots such that they weren’t noticable. The weak point were the scollers, which were left on when the colors were changed, creating this districting color cavalcade when not-adjacent color changes occurred. The lighting board operators were Cullen Pinney and Stacey Cortez, with Jason Alexander, Danie Danebrock, Jason Henderson, and Matthew Miller as spot operators. The costumes, by Judy Ashton, where quite clever in their use of available resources (which, being a community college production, were limited). The set, designed by Cathy Susan Pyles [ ], was minimalistic, consisting of some steel frameworks and various props. Danielle DeMasters served as stage manager, assisted by Stacey Cortez [ ] and Nicole Ruiz [ ]. Being a musical, there was a fair amount of dance and movement, which was quite good and varied. The dance ranged from ballet-like moves, to ensemble pieces, to rap style movements. The choreography was by Ashleigh Lonning, assisted by Crystal Castillo. Alicen has 3 more performances: May 7, 8, and 9 at 8:00pm at LAVC. Call 818 947-2790 for reservations. Ticket prices are $15 for general admission, $10 for seniors/students. ETA: You can see a video sample of the show here. Lastly, I should note that this is the first production we’ve heard of at LAVC: it would be nice if they had a mailing list so we could learn of future productions (hint, hint). One last little note on the production: It reminded me of my copy of the book “The Annotated Alice”, which was given to me by my brother before he died, and which I still have. A nice memory to have return. Upcoming Theatre: Next Saturday, we’re going down to Long Beach to see “Is He Dead? at ICT Long Beach. May 17 will be “big” at West Coast Ensemble, to be followed by “The Green Room at Hermosa Beach Playhouse on May 24 (pending ticketing). The end of May (May 28, 29, 30) brings “Fiddler on the Roof” at Nobel Middle School, where nsshere is doing the lighting design. On June 6 @ 8pm we’re scheduled for “I Love You, You’re Perfect, Now Change” at Repertory East Playhouse, but since we saw that when they did it two years ago, we’re planning to switch to “Fat Pig” in their “81 series” on July 11. As this opens up June 6, we might go to the last weekend of “Marry Me a Little/The Last 5 Years” at East/West Players. Lastly, June 20 @ 8pm is “The Little Foxes” at The Pasadena Playhouse.